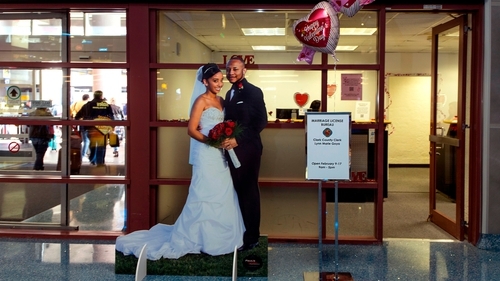 The authority that administers weddings in Las Vegas has opened a pop-up marriage licence bureau by a baggage carousel at McCarran International Airport for lovebirds desperate to get hitched on Valentine's Day. A steady stream of couples has been arriving at the office to get their marriages off the ground without all the fuss. The US desert oasis known for all-night gambling, extravagant shows and no-holds-barred boozing has for decades also been a magnet for couples from around the world looking to tie the knot quickly and cheaply. The pop-up office's $77 licences are good for all of Vegas's famous venues, including the Cannabis Chapel, Elvis Chapel, Chapel in the Clouds, and the Viva Las Vegas Wedding Chapel. The wedding industry contributes more than $2bn annually to the local economy and Clark County issues about 80,000 licences a year, more than any other office in the country. Around 1,500 of those are issued for Valentine's, about double the rate for a normal day, with more than one in every 25 US marriages taking place in Vegas. "It was super convenient to have this set up here, the marriage licence bureau," said Gail, proudly brandishing a white package emblazoned with red hearts containing the document.